Building a new home can be a lot of work, and if it’s your first time building, you probably have a lot of questions. The good news is that the lending experts at Town & Country Credit Union are here to help you through the process. Learn more about our process and see how we can make your building process easier. Contact one of our Executive Mortgage Officers for more information or get your application started online! 1. Get Pre-Qualified You need to identify how much you can afford to spend. Apply online or make an appointment with one of our Executive Mortgage Officers to start the process. A few factors to take into consideration with financing! Bridge Financing Using the equity in your existing home as a down payment may be an option for aiding in the financing of your construction loan, especially if you plan on living in your existing home while building your new home. Gifted Land If you are fortunate enough to have a family member that wants to gift you a piece of land we are able to count that as part of the appraised value. Starting Construction Using Your Own Funds We recommend that you do not start construction using your own funds unless you can fund the entire process. If you start and later require a loan you may have difficulty getting a construction loan or other financing. 2. Select a Lot and Location You need to choose the land you are going to build on. Real estate professionals that specialize in finished lots can be very knowledgeable in helping you choose a lot and location that has the amenities you require. Important to take into consideration is finding a lot adequate for the size of home you are looking to building. You’ll also want to recognize the additional resources that could be needed to build on a lot that is sloped, in a remote location or on a hillside. If you find a lot you would like to purchase, but will not immediately build we can still help you finance through a short-term residential lot loan. 3. Choose a Builder or Contractor Seek out referrals from friends, family or individuals who have recently built a home. Visit homes that the builder has completed. Interview potential builders and contractors and be sure to request references and estimates. Keep in mind that cheaper may not always be better. 4. Communication The key to any successful relationship is communication and building a home is no exception! Work closely and share information with your Executive Mortgage Officer and builder throughout the process to ensure everything goes smoothly. Your builder will provide you with a contract, but before signing it is important that you review and understand it. Take into account that the contract should be complete, specific and easy to understand. Final plans and specifications - needed to obtain an appraisal. Builders Risk Insurance – special property insurance which indemnifies against damage while under construction. After we receive these documents we’ll order an appraisal and collect from you any required fees. Once the appraisal is received we’ll submit your information to our underwriters to gain final loan approval. Construction can start with final approval after the closing. You or your builder will make periodic requests for payment during the construction process. Payments are provided through loan draw requests that are first verified by a construction lender to ensure that the improvements have been made on your home. Inspections are required before we can disburse any funds. We ask that general draws be included together and submitted every two to three weeks; unfortunately we cannot process on a weekly basis. 1. Invoices, copies of paid receipts or cancelled checks for all funds to be disbursed. 2. Lien waivers from all companies. 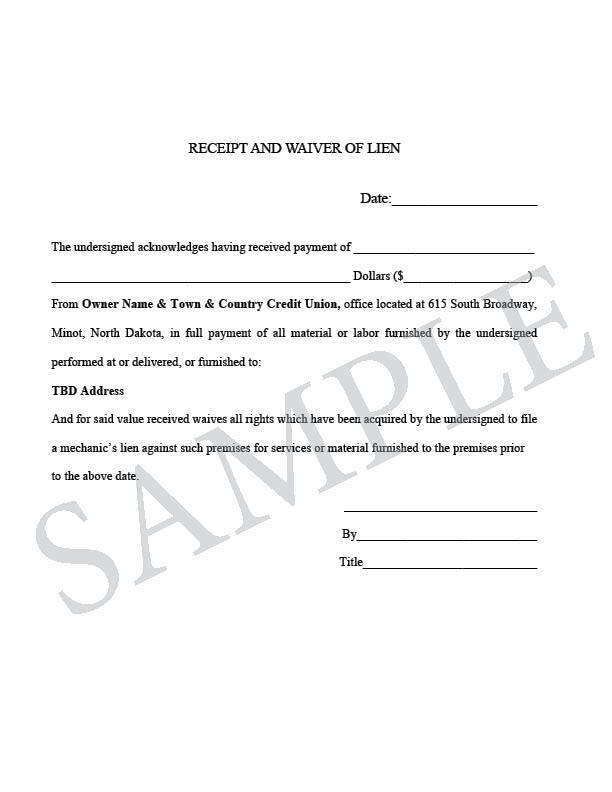 A lien waiver is a document stating that they have received payment and waive any future lien rights to the property. They can be provided after checks are received, but prior to the next draw being funded. 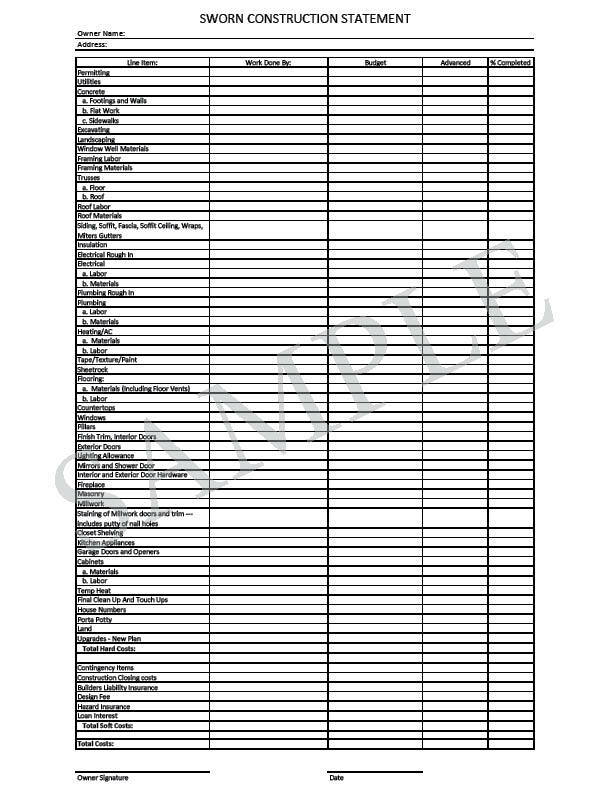 (see example on page 8) Once we have this information, our goal is to process your check within one business day. If a check is needed immediately, we will work with you to get it as soon as possible. Any large overages above the original bid will need to be discussed with your Executive Mortgage Officer. If a large overage occurs you may need to pay for this out of pocket if there aren’t funds that can be assigned to cover the additional expense. The only payments required on your loan during construction are interest only on the amount owed each month. You can personally purchase items for construction, but you will need to submit all receipts for purchases. A copy of the cancelled check is also required for proof of payment. A lien waiver will need to be signed by the company receiving the payment. Credit documents that were used in the approval process of your construction loan expire after 120 days. It’s important that you keep your finances in good standing throughout the construction process. If your income, job, assets, debts or credit changes it may affect your permanent financing approval. If the permanent loan amount changes all credit information will need to be reviewed again. Your home is nearing completion! It’s time to discuss permanent financing. •Within 60 days of your home’s completion we will request any information on your credit or personal finances that we need updated. •Don’t be too quick to move into your new home. Communicate with your Executive Mortgage Officer when you are ready to move in. There might be a right of rescission period as a provision of your permanent loan. •As long as your permanent financing loan closes within one year of your original appraisal date, we will not have to order a second appraisal, which saves you money! The appraiser will still need to go out and perform a final inspection of the home. •After the final inspection is received we’ll submit your information to our underwriters to gain final loan approval. We’ll then process your loan and set up a time for your closing with the title company.